Kentucky Fish and Wildlife officials shot and killed a mountain lion in Bourbon County. A woman was walking her dog spotted the mountain lion which quickly ran up a tree. 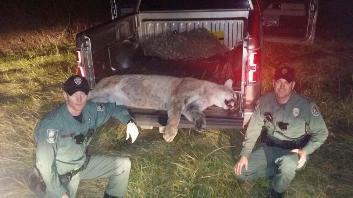 Kentucky Fish and Wildlife officers shot the mountain lion because they didn't have tranquilizers with them. He said it was nearly dark and if they waited for someone to bring them tranquilizers, the animal could have gotten away and posed a danger to the public. Management is standing behind the officers decision. As expected the animal turned out to be a young male cougar. These are the ones that frequently travel hundreds of miles to find a new territory to call there own. I beleive the last confirmation was back in the 1990's!